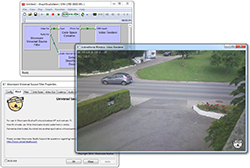 Netcam Studio is our next generation surveillance software. It offers most features of webcamXP and webcam 7 as well as new ones, is available in 64-bit and offers better audio support and increased performances. We recommend new users to start by downloading Netcam Studio rather than webcamXP or webcam 7.
webcamXP Free is free for private use and allows connecting up to 2 cameras. To use RTSP Sources, please install Visual C++ 2013 Redistributable (32-bit) and .NET Framework 4.5. On Windows 10, please ensure that the Media Feature Pack is installed or install webcam 7 instead. By downloading or installing, you accept the End-user license agreement. webcam 7 allows streaming in Flash Video (FLV) instead of Windows Media. Any license for webcamXP PRO is also valid for webcam 7 but there is no Free or Private version. Use your network cameras in Skype, Webex and all applications which do not natively support these cameras. It's also possible to use this filter in webcamXP or webcam 7 to connect the cameras for which no templates are available. This filter does not require to have webcamXP or Netcam Studio running, it's a standalone product compatible with our other softwares. The free version will display a small Moonware Studios watermark*. It's possible to purchase a license to remove this watermark. More information and discussion about this filter on the Moonware Studios Community. This filter requires Visual C++ 2013 Redistributable (32-bit) and .NET Framework 4.5. Our legacy Directshow Filter allows to connect network cameras providing JPEG images or MJPEG streams in application accepting local sources. This product is now available free of charge for a single source for personal use. 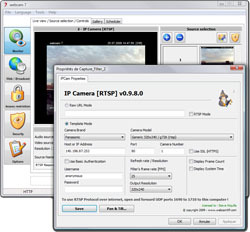 In order to use multiple instances, a license for the filter is included with webcamXP PRO.